‘Patience is a virtue,’ reads the age-old advisory. There is, perhaps, no saying more apt to accompany the tale of Semi Ajayi’s ascension. For this is a 25-year-old footballer who, despite having already been on the books of Charlton, Arsenal and Cardiff, will complete just his second full season in professional football when Rotherham’s Championship campaign concludes next month. Some in his position may have grown tired, frustrated – angered, even – at the lack of first team action; the carrot dangled in front of them consistently unreachable. But not Ajayi. With his pragmatic approach, the rise has been a lengthy, drawn-out process, but one is that is now, finally, bearing fruit. And plenty of it. “I learned a lot, especially at Arsenal,” Ajayi tells Sky Sports. “I feel like my game came along leaps and bounds and I was around world-class players, training with them day in, day out. I had great coaches and great facilities and I was just a sponge when I was there, soaking in all of the information that I could and trying to improve as much as I could. That chance was granted by the Bluebirds, when the 6ft 4in centre-back joined the then-Championship outfit on a short-term loan in March 2015. Not a single senior appearance followed, though a sufficient enough impression was made for a two-year contract to be tabled. Less than two months into the 2015/16 campaign, there was a breakthrough. It was not at Cardiff, though. Russell Slade allowed Ajayi to join AFC Wimbledon on loan, before he made 13 appearances during three months with Crewe. For that experience, there is a genuine sense of gratitude. “The time at Cardiff was valuable because I managed to go on loan and get my first-ever games in the Football League, so that was really good for me,” he says. 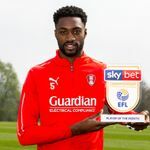 “The time I spent out on loan in my first season is what set me up for my move to Rotherham and, essentially, set me up to become established in the Championship. It was three weeks shy of a year later before, in January 2017, he was shipped back out by the Welsh side, this time to beleaguered Rotherham, who, after the resignation of Kenny Jackett, were en route to a miserable relegation, aided by an eventual Championship record-low points total of just 23. At the New York Stadium now, though, he has settled under the tutelage of former Millers striker Paul Warne, whose own rise, ironically, draws similar parallels from one of his emerging talents. The 45-year-old club legend has transformed Rotherham from a second-tier laughing stock to a well-oiled machine punching well above its weight; Warne may have one of the lowest budgets in the division at his disposal, but what they lack in financial clout, his team more than makes up for in spirit. “When I first came in on loan, he was caretaker manager who was just putting out fires and trying to make sure we made it to the end of the season in one piece, really,” Ajayi continues. “But once he was given the job permanently, he was allowed to put his stamp on the team when we went down to League One. I feel like this is more of a team playing the way he wants us to play; all singing from the same hymn sheet and that’s the main difference. “He only signs human beings that he knows he can get that never-say-die attitude from. The fact we’ve got a really close-knit group and everyone is genuinely friends on and off the pitch, plays a massive part in why our team spirit is so good. We have just got a never-say-die attitude and that has really helped us to grind out some results this season. And what is that aforementioned fruit that has been borne out of his eventual break? There has been the recent move from central defence into a holding midfield role, an “amazing” opportunity to become part of Gernot Rohr’s Nigeria squad and a career-best eight goals this season. Not to mention picking up the Championship Player of the Month award for March last week after netting five goals in five games, including a scintillating double in the 2-1 defeat of QPR at Loftus Road. “It’s a really, really good achievement and I’m really pleased and honoured to have won the award,” Ajayi continues. “For the last couple of months I’ve been playing in midfield exclusively, so that’s been a new role for me; one that I’ve enjoyed and I’ve relished the challenge of getting to grips with it. It means I’m there as an insurance policy for the team if anyone loses their man, if anyone gets through I’m there to sweep up, mop up the mess and protect the back four as best as I can. That’s basically what I’m there for. “I started off playing football as a striker, as I’m sure most of us do, and I moved to midfield and then gradually moved back into defence. I was a midfielder, but I didn’t have a specific role of being a defensive midfielder ever in my career. I just love playing football, to be honest. I’ll play anywhere. With four games remaining in the 2018/19 season, those survival hopes still hang in the balance – Ipswich have already been relegated to League One, with lowly Bolton all-but set to join them imminently. There is, seemingly, a four-way battle between the Millers, Wigan, Millwall and Reading. But with so few points separating each team from one another, it could be the final day of the season before the final berth is confirmed; after helping his side battle to a 2-2 draw with Stoke last time out, Ajayi’s cool-headed persona will, without doubt, prove a valuable asset for his side. “We’ve believed in ourselves from day one,” he explains.